July 27, 2018 - By The OTC Team! You can bring a horse to water but you can’t make it drink. You can set up an easy and effective employee time clock, but you can’t guarantee that they will remember to clock in every day. Your management team has better things to do than stand over your employees to make sure they clock in. And you’re not alone. Hundreds of employers across the country face the same problem: how can you help employees remember to clock in? There are a few tactics you can test within your organization to increase the percent of effective employee punch ins. Check out this list to figure out which ones will work for your company and your employees. Note: legally you have to pay employees for their time worked. As we recently discussed, you can’t withhold pay or refuse to compensate your workers because they forgot to clock out. There might be a reason why your employees aren’t clocking in or out. If your software is slow or hard to use, it might be worth it for employees to “forget” on a busy day and email HR later. Get feedback from your employees and figure out if the process is too prolonged to be effective. Some companies still use outdated software that hasn’t been updated. Other companies require a host of information including employee ID numbers and birthdays. If security is an issue in your organization, consider investing in fingerprint scanning technology. This is fast and more effective than lengthy clock-in requirements. More companies are letting their employees work from home or on the road, which can be a nightmare for HR teams. These employees either email their hours each day or ask their HR representatives to retroactively add the time later. Instead, give employees the power to clock in and out remotely, either on their smartphones or through a company laptop. Active remote employees can also hold in-office employees accountable. If someone can clock in from Singapore or during a packed conference in Chicago, then there’s no excuse for everyone in the office to punch in. Host a company-wide competition with monthly or quarterly rewards for perfect timesheets. Challenge teams to hold each other accountable to have accurate time sheets. Reward new employees for understanding the timesheet process and congratulate their managers for a successful onboarding process. Rewards for these competitions or challenges can range from small celebrations (like a catered breakfast) to major rewards like extra vacation time or a day off. You want your team to work for their rewards, but not feel like they’re out of reach. If you want to punish employees for not clocking in and out, then you need to develop a disciplinary process for the whole company. In the employee handbook, clearly state what qualifies as a violation and the process that follows is employees regularly ignore the time clock. Most companies give employees verbal and written warnings about repeatedly not clocking in or out before placing employees on probation for not following company rules. The CEO should not be concerned about employees clocking in and out. If there’s a problem with employees forgetting to clock in, senior leadership should work with lower-level management to address the problem on a team level. Train your managers to talk to their employees about punching in and reminding them to clock in and out during the day. If each manager keeps an eye on a few employees, then they can catch people who forget to clock in instead of placing the burden on HR. In all likelihood, there are employees who will always clock in and employees who will always forget. If your managers can identify these “problem employees,” then they can take steps to remind to punch in. 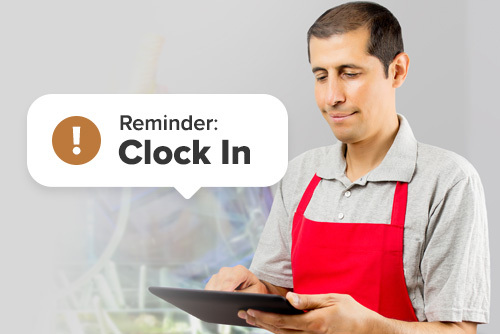 On The Clock offers text alerts when employees clock in and out. Managers can sign up for these alerts to know that difficult employees clocked in. If the employee misses a punch that day, management will notice immediately because of the missed text. It’s possible that your employees are just forgetful, but there might be a reason if certain employees repeatedly forget to clock-in or out. Maybe one employee has a late meeting on certain days and doesn’t want to go back to their office after it ends. Maybe the computers aren’t always on in the mornings and early employees can’t clock in. Solving any problems related to the clock-in process shows that you care about your team and want to make it easy for them to follow company policy. If your employees aren’t getting the hint that they need to clock in and out every day, set up additional stations around the office. All it takes is a tablet or laptop for employees to clock in when they arrive and clock out when they leave. You can easily mount these tables by doors or place them on nearby tables. The act of seeing the time clock by the door will remind most employees, and offer a convenient alternative for those who already powered down their work computers for the day. Your employees are adults. Set aside time to explain the benefits of clocking-in regularly. Once most team members understand how clocking in helps the company, they are likely to comply and remember to do it. Some employees might feel like a time clock is a micromanaging tool meant to monitor employees. Instead, focus on benefits to employees like making sure they’re not overworked and helping the company realize it needs to add additional staff. Improving employee participation can be as simple as sending out simple reminders. If you HR team sees an increase in employees forgetting to clock-in, send a message out to the company. A gentle reminder during a town hall meeting or mention in the company newsletter can help employees realize the importance of clocking-in. On The Clock makes it easy for employees to clock in wherever they are. Your team members can use apps on their phones, clock in from their desks, or find tablets and fingerprint scanners by the door. Consider switching to our tool if you want to give your team members the tools to easily remember to clock in and out.